This fun couple from New Jersey found the mountains of Maine and Granite Ridge as the wedding venue that matched their dreams. Here is their love story. Elizabeth is from Edison, NJ. After an undergrad experience at Kean University she acquired her Masters in Occupational Therapy at Springfield College in Massachusetts. Devin hails from Metuchen, NJ and after years of volunteering at his home town Fire Department, he became a full time Firefighter with the Edison Fire Department in 2014. They currently reside in North Brunswick, NJ where their cat, Bandit, is at the center of their lives. They are animal lovers who can't wait to be homeowners soon so that they can expand their Animal Kingdom with additional cats and dogs. Their favorite activity is making themselves and others laugh. Although Liz & Devin love doing everything together, she does mention that perhaps Devin's upbringing with four sisters has led to his tolerance for some of her activities that might not have been his first choice. They love the outdoors, especially biking together at their special place, Long Beach Island. "Everything in our lives revolves around pizza. Pizza is everything," started Liz. In May 2013, Liz went to visit her best friend, Ginny, at LaRosa's Pizzeria in Metuchen. It was here that she saw the goofy delivery boy/man with cowboy boots on and thought..."why the heck is he wearing cowboy boots?" When Liz asked Ginny about the boots, she replied, "oh yeah, he does that." After some quick conversation with each other, Devin had to leave for a delivery and Liz had to go to work. It was up to Ginny to bring these two together, so she did. After a few months of casually hanging out at the firehouse where Devin volunteered, carnivals, the beach, country concerts and slip-and-slide parties, Devin asked Liz to be his girlfriend. Not even a two year long-distance stint in the relationship could keep these two away from each other. Devin had the ring almost four months before deciding on the perfect way to propose. In the meantime, he stored the ring safely underneath Liz's side of the bed...where she unknowingly slept on it! Two months before completing her degree at Springfield College, Liz & Devin decided to get an apartment so that they could live together once school was complete. The move-in date was March 10th, 2017. That morning, Liz drove to NJ to help Devin with the move-in process. With the help of family and friends, everything went smoothly and almost every box was unpacked by the time the sun went down, except for one. Devin yelled over, "Liz, what do you want to do with this last box?" 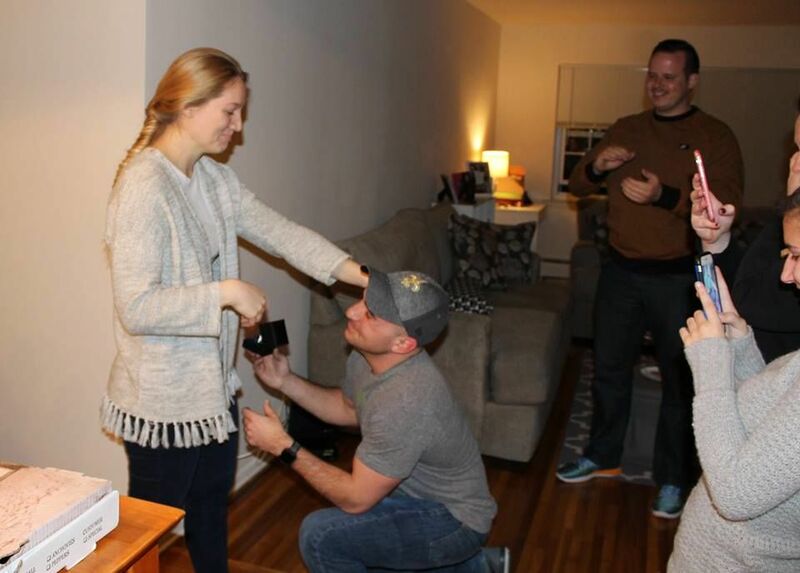 By the time she turned around, he was down on one knee. Liz was shocked and overjoyed, and shortly after champagne was popped. Our couple wanted a Destination Wedding, but one that friends and family could still drive to. Before getting engaged, Liz had been to Ogunquit once and Devin had never been to Maine period. They knew they wanted an outdoors, laid-back, "cowboy boots kinda place." As soon as they saw Granite Ridge online, they knew they had to get married here. Liz actually discovered Granite Ridge nearly 2 years before their engagement and both of them immediately agreed it would be their wedding venue one day. After Devin proposed, they booked Granite Ridge, nearly a year before they would even see it in person for the first time! They finally arrived in the dead of winter, February 2018. Liz gushed, "I was speechless, completely blown away, the views are breathtaking. After Micki gave us the tour, we couldn't leave the barn for half an hour, we just kept looking at the views, taking pictures." Devin added, "we knew we made the right choice. It's impossible to get stressed here, it feels like vacation." Our couple also added that they enjoyed being able to pick their own vendors, so that they could have the wedding catered to the custom feel they desired. We can't wait for Liz & Devin to experience Granite Ridge during the Autumn season for their wedding! Liz & Devin feel that they have the "dream team of vendors" so it was nearly impossible to not name them all. They had heard so many amazing reviews, both online and from friends, about Bread & Butter Catering. The had a great first impression and felt they met their vision of "upscale laid-back comfort food." However, their Mac & Cheese sealed the deal! Devin raved about their DJ Jacob Sounds as "he went above and beyond, and gave some really great overall wedding advice." They were both impressed with Nora from SP Films, who will serve as their videographer. Devin grew up with a Boxer, and when they saw 2 Boxers on her website, they knew it was meant to be. We're also personally excited about the Jersey bagels that Liz will be freezing and bringing up for the weekend!